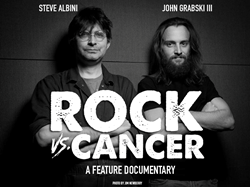 Feature documentary 'Rock Vs. Cancer' tells the story of John Grabski III, a musician with terminal cancer who spent his last days recording a rock album with legendary record producer Steve Albini. John Grabski's example of standing defiantly against cancer is an encouragement to cancer patients who may feel alone, defeated and ready to give in to their diagnosis. Free Verse Films has launched a crowd funding campaign via Indiegogo for the new feature documentary, Rock Vs. Cancer. The film will tell the inspiring story of John Grabski III, a musician with terminal cancer who spent his last days recording a rock album with legendary music producer Steve Albini. The filmmakers are looking to raise $200,000 for the project. You can watch the pitch trailer here. The mission of the film is to help those with cancer, especially young adults. All proceeds from Rock Vs. Cancer will be split evenly between Sands Cancer Center in upstate NY where John received treatment during his illness and Stupid Cancer, the largest charity that comprehensively addresses young adult cancer through advocacy, research, support, outreach, awareness, mobile health and social media. "John Grabski's example of standing defiantly against cancer is an encouragement to cancer patients who may feel alone, defeated and ready to give in to their diagnosis. In sharing John's story, we hope to encourage others to confront their disease head-on. John's story and his rock album serve as a reminder that putting life on hold isn't an option ... life keeps on going whether you want it to or not, so seize the day and make the most of your time here on earth." Based in Chicago, Steve Albini of Electrical Audio Studios is best known for his work with Nirvana, PJ Harvey, the Pixies, and Bush. On the close to 2,000 albums he's worked on, he prefers to be known as recording engineer rather than producer and refuses to take royalties from the bands he works with. Steve also plays music himself and is part of the rock band Shellac. He cites John's album "Teeth: The Strain," which chronicles the musician's 5 year relationship with the disease, as one of the most meaningful projects he's ever worked on and says of John, "I hope when I die I go like John, embroiled in the middle of things, surrounded by people I love, doing the things that matter most." Rock Vs. Cancer is an in-depth look at John's final days as he made his way to Chicago to record with Steve, fulfilling his life-long dream. Through insurmountable odds, John left behind a hate letter to cancer and a love letter to life, assembled within the construct of a 30-minute rock & roll LP. Rock critic Everett True describes John's album "The Strain" as, in essence, "The finest grunge I’ve heard in many a decade." Those interested in supporting the film can donate to Rock Vs. Cancer via Indiegogo through May 20th.